Key Illinois employment laws, and who must comply. Access the full Illinois Employment Law Manual (over 50 state-specific reference resources) and Illinois Employee Handbook templates below, as well as view state and municipal deadlines, additional state-specific resources and links to municipal coverage. Updated to include law regarding union security clauses, effective April 12, 2019. Illinois employers seeking to demonstrate their commitment to a workplace free of harassment and ensure compliance with the Illinois law requiring employers to provide a written sexual harassment policy to employees, should consider including this model policy statement in their handbook. Updated to reflect the addition of the Sexual and Other Unlawful Harassment Handbook Statement: Illinois. As mandated by the Illinois Department of Human Rights, covered employers must post the Illinois Sexual Harassment and Discrimination Poster. Updated to include Illinois Human Rights Act notice-posting requirements. On this podcast, XpertHR Legal Editor David Weisenfeld moderates an in-depth discussion about employer biometrics use with insights from Kate Bischoff, of tHRrive Law and Consulting, and Greg Abrams of Faegre Baker Daniels. 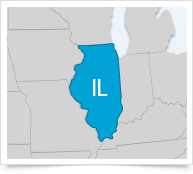 A round-up of the comprehensive state coverage XpertHR offers to help Illinois employers ensure they are compliant with state HR and employment laws.